A French drain or a drain tile is built by filling a trench with gravel and a perforated pipe is used at the bottom to divert underground water. A geotextile fabric wraps the pipe and gravel acting as a sieve where fine sediments will not pass to the area where the gravel is located. A properly designed french drain reduces the pressure exerted upon retaining walls and subgrade walls that with time can induce moisture inside basements and crawl spaces. A French ch drain system is an indispensable component of any subgrade waterproofing project. The drainage system should not be more than 12 inches wide, between 6 and 8 inches will be ideal, because it will probably last longer and water will be collected and transported better with fewer obstructions. As a good practice, you can also have at least 2” of gravel around the pipe and the geotextile fabric used must be installed so the pipe is completely covered with it. The pipe installed in the trench must also be installed with the holes on the bottom. The French drain system should be installed deep enough, so water will eventually run into the pipe, instead of moving near or into the structure. 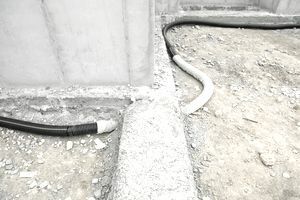 The recommended slope of the perforated pipe for a french drain system is a one-inch drop per ten feet horizontal run. When a French drain is used to protect a living space, the invert of the bottom shall be placed at least 2 inches below the level of the finish floor. However, it is recommended to use a professional consultant that can determine the correct elevation of the drainage system. Pipes specified to be used on French drains pipes are normally 6-inch diameter perforated PVC SDR-35. If the job or area to be worked is small, you might want to try a four-inch pipe but remember it will all come down to the amount of water being handled. Some experts recommend using smooth wall pipes, while others tend to use corrugated pipes. A perforated pipe is manufactured with two rows of round holes, normally installed facing the bottom of the trench as part of the french drain system. As a contractor, you might want to add a fabric filter to help reduce the clogging of the pipes. Also, you might want to make sure that the right slope and the piping size is adequate to handle the water flow. French drain gravel should be washed three quarter inch minimum and as large as 1 ½ ” crushed stone. The upper 12 inches above the pipe shall be filled with native soil, to avoid having crushed stone over the perforated pipe that could damage the pipe. It is important to place the gravel around the pipe because they will filter any sediment that the geotextile is not able to remove. An important piece of a french drain is the geotextile that covers the pipe. All crushed stone shall be protected and wrapped by a geotextile filter, a long-lasting manufactured material that will protect the pipe. The introduction of a drainage fabric around the aggregate can prevent in-situ soils from being washed into and clogging the drain. These geotextile filter fabrics will prevent soil fines from entering the drainage system, extending drain life and increasing performance. There are prefabricated drainage systems made of two parts: a geotextile fabric and a molded plastic core. Geotextile fabrics are attached to the core, providing excellent drainage while preventing the backfill from entering the core channel. These prefab drainage systems can reduce installation costs because they can be installed faster than traditional drain tile.